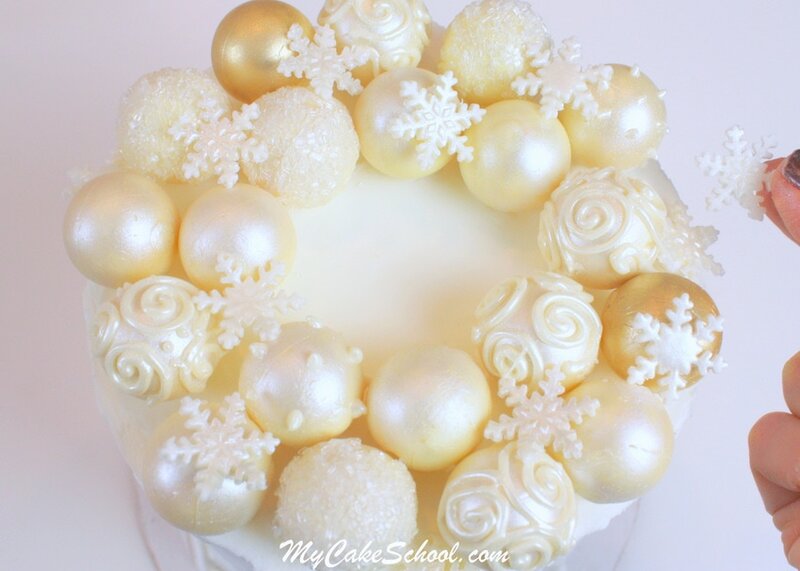 Today I’m going to share an elegant ornament wreath cake design that is SO simple to make. Our inspiration for this design is from the many beautiful ornament wreaths that I’ve seen floating around on Pinterest & on neighbors’ front doors. Grab yourself a bag of white chocolate truffles and let’s get started! In the tutorial I’m using a six inch round (double barrel) cake although you could adapt this design to fit a cake of any size. 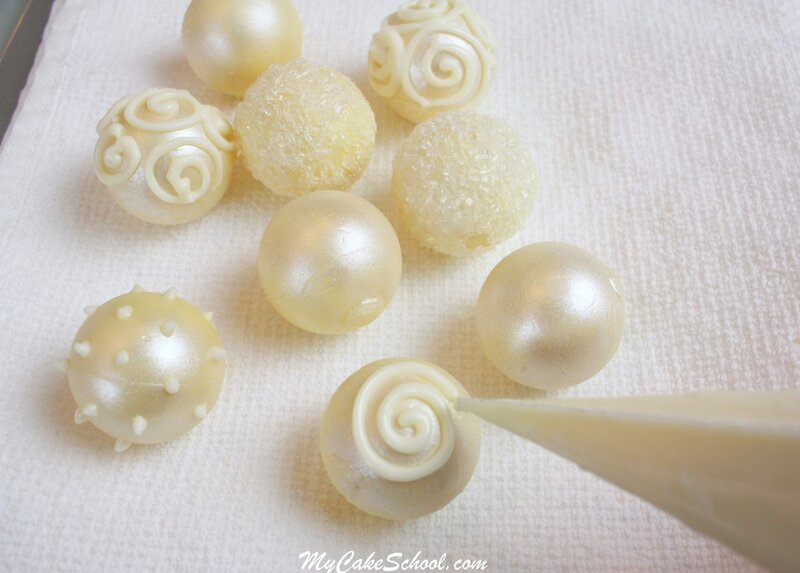 White chocolate truffles are PERFECT for creating these beautiful oranments. I used Lindt Lindor truffles, which I found at our local Rite Aid, but I’m sure that you can find them in a number of stores. If you enjoy making cake truffles/cake balls, they would make a great alternative. I wanted to add a bit of drama and shimmer to my truffles with a dusting of super pearl dust. What a difference! 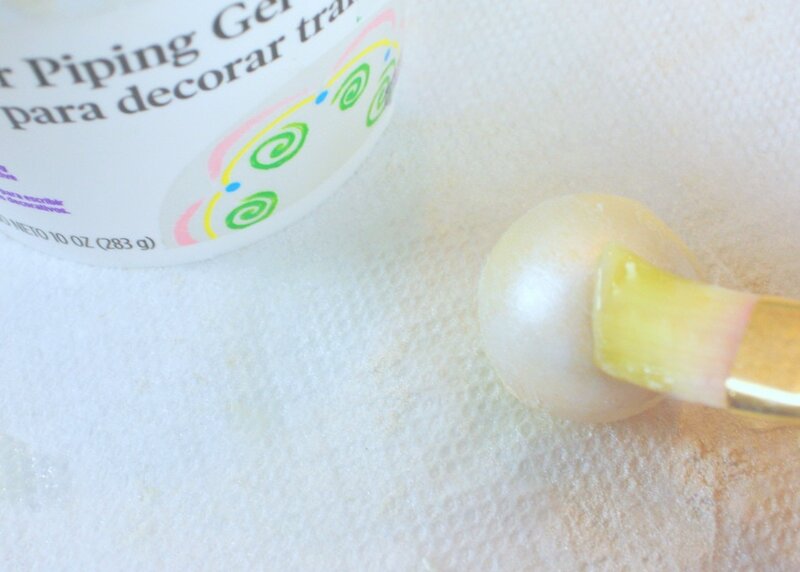 You could also use pearl spray (Wilton or PME brand for example). If you don’t want to pearlize, we’ll show another option with sparkling sugar below. Some of our truffles were dressed up with sparkling sugar! To make the sprinkles stick, I first brushed the truffles with piping gel. 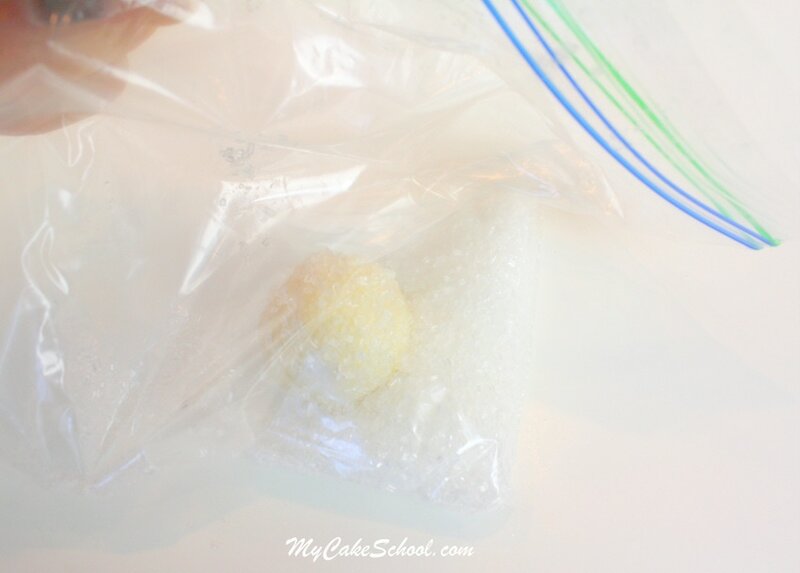 Then, I poured the sparkling sugar into a ziplock bag, placed the sticky truffle into it, and gave it a good shake! If you like piping and scrollwork (like me! ), you may like to add some swirls to your truffles. I melted candy coating, spooned into a piping bag with the tip snipped away, and some swirls and dots. I chilled for a few minutes until set, and then dusted the swirls and dots with more pearl dust. I dusted some of the other truffles with gold luster dust. I went with a pearl and gold theme, but these would be so cute with colorful dots also…maybe even mix in a few peppermints. There are so many options! 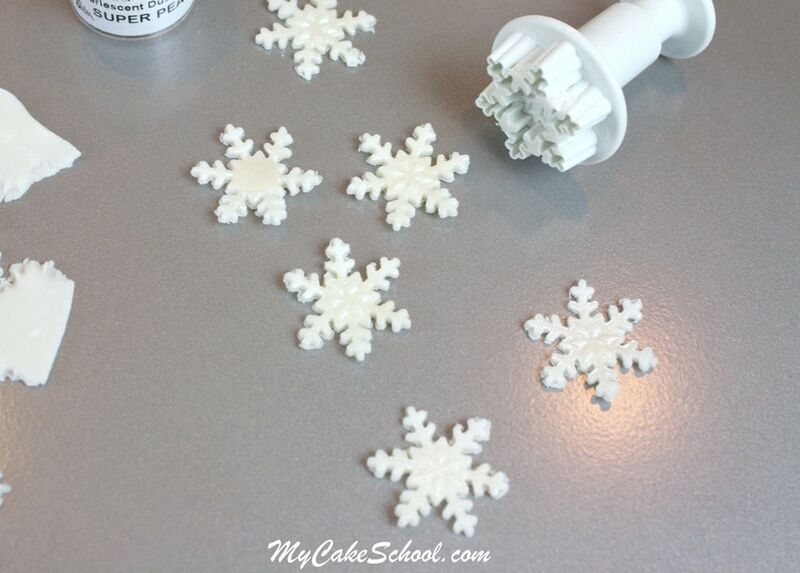 Finally, as an optional step, I decided to add a few fondant snowflakes that I made with my PME snowflake plunger cutter. 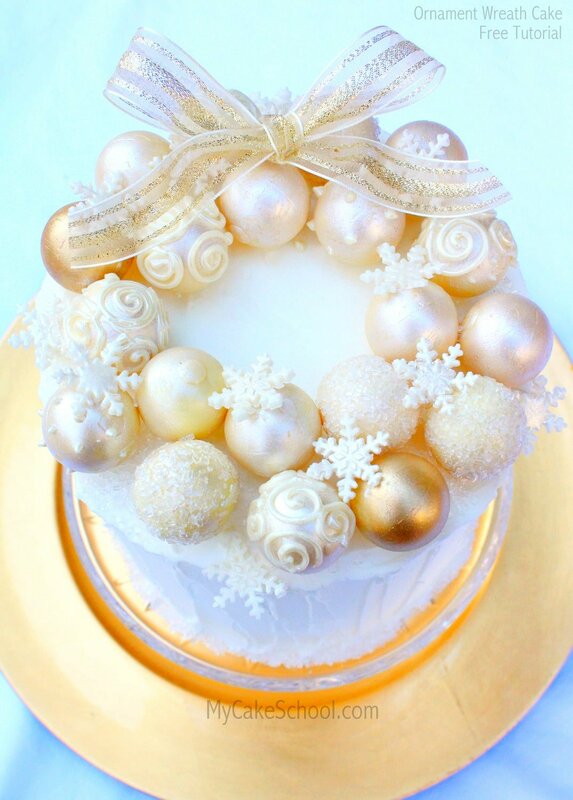 I arranged the truffle “ornaments” and snowflakes around the top of a 6″ round cake which was frosted with vanilla buttercream. You can glue these truffles into place with a little frosting. Finally, I added a bow to my truffle/ornament wreath and secured with a dot of frosting. I love the look! Thanks for stopping by, I hope you’ll give this wreath of elegance and deliciousness a try this holiday season! :0) Have a great weekend! How lovely! I make a lot of wreaths at the holidays to give to my friends and family. I use ornaments that I collect all year. This cake is simple enough for me to make for my annual holiday party and shows off two of my favorite hobbies: baking and crafting. Thanks for another fantastic idea. I had to smile when I saw this beautiful little tutorial. Every year, without fail at least one of my cakes ends up with a truffle wreath! Now I consider it a tradition!! It’s usually because I’ve had to do a last minute cake with no time left to decorate. 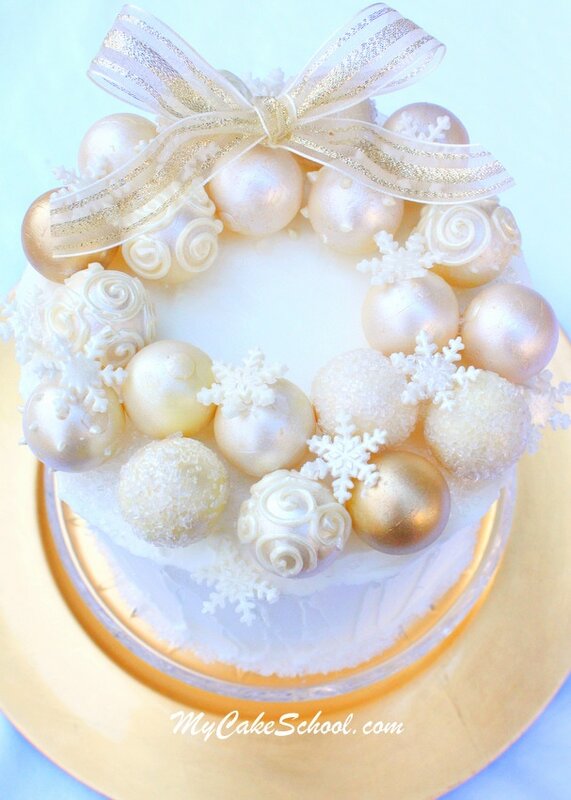 Your truffle wreath is gorgeous, I just love the piped swirls which gives the wreath such a luxurious look. Thank you for sharing your ideas. I would like to wish you both a very Happy Christmas and peaceful New Year. You are awesome Melissa. I can’t wait to make these. So beautiful!!! Just bought my chocolates on sale in Target which makes me more excited to make these. LOL. Wishing you and your family a very Happy Holiday Season. Looking forward to all of your great ideas. You rock. Question, did you put piping gel on the gold truffles before you applied the gold? Question. 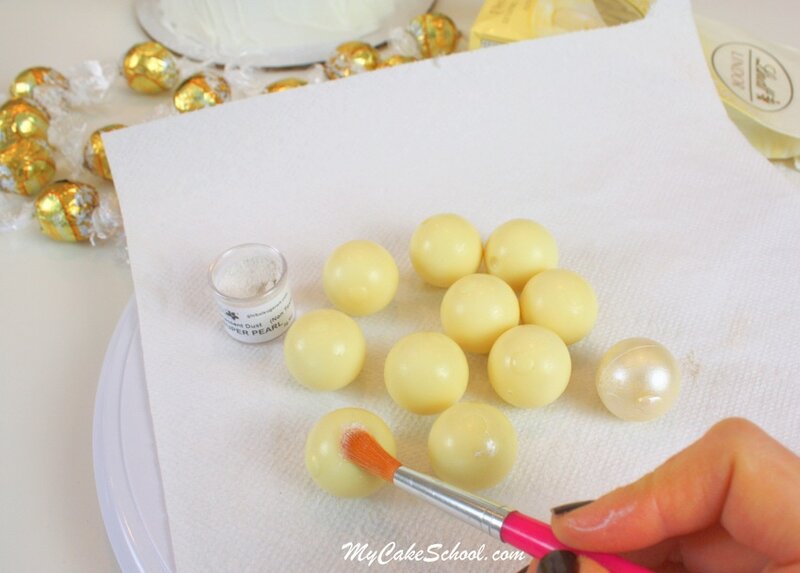 Did you roll the gold colored truffles in piping gel first? The only piping gel that I used was for making the sugar crystals/sparkling sugar stick. For the pearl dust and gold luster dust, I just used a dry brush and dusted on the pearl & gold. Not all gold luster dusts will give the same depth of color, so if yours doesn’t look just like mine,it could just a matter of a different brand or shade of gold dust. You come up with the most amazing and beautiful creations! Thank you for all your sharing!!! What size cake did you make for this? Hi Tina, It is a 6 inch double barrel cake. Hi Sarahjane, Thank you for being a part of the site!! We use almost exclusively Duncan Hines cake mix 15.25oz. This is stunning!! So elegant and I think I can do this one too. ;) Melissa, can you tell me the brand and color you used for the gold and what brand pearl dust you used? Thanks so much! Can’t wait to make this. What cake recipe did you use for this double barrel? Hi Gloria! I’m glad that you plan to make it! I like Rolkem Super Gold luster dust. 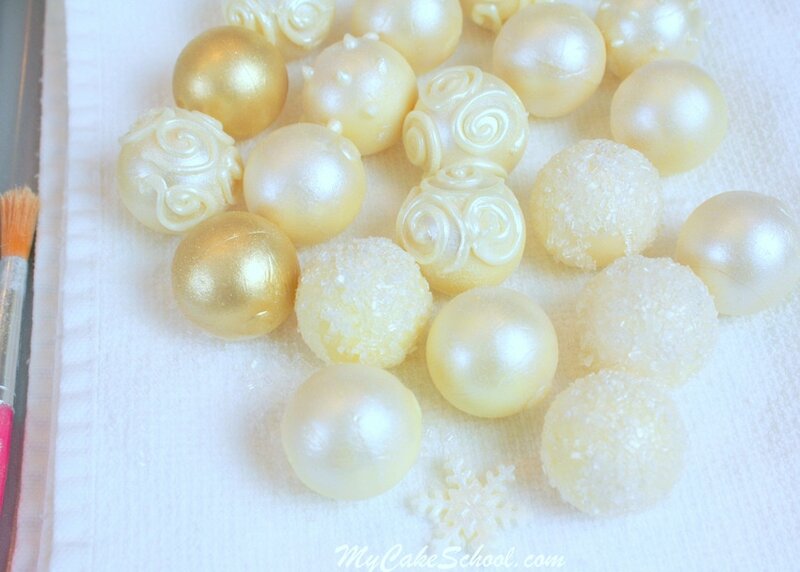 For pearl dust, I use Super Pearl that I purchased from Global Sugar Art but the Wilton Pearl Spray should work too. Have fun! Merry Christmas! Just had to let you know how much your ideas are loved… I made this cake (8″) for my family and it turned out great. Thank you for all your simply beautiful designs!